The Samsung Galaxy Note 8 promises to be, I think, a sweet phone. With a built-in stylus, impressive specs, wireless charging, and expandable memory. This, like all it’s predecessors in the Galaxy Note line, looks like a serious work horse. And a beauty. You can read Jen’s review of it here. If you switch to Sprint, (preorders started today; phones will start shipping September 5) you will get 50 percent off the lease price of the Galaxy Note 8. That means you would pay $20 a month for 18 months with $0 down. Once you get 12 months into that lease, you’ll qualify for the Galaxy Forever program which allows you to upgrade to a new Galaxy whenever you want. 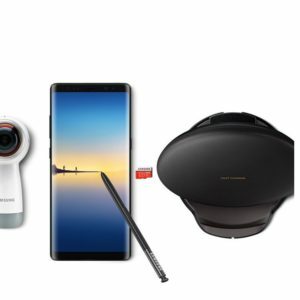 If you get in on this before September 25, you get a Samsung 128GB EVO+ memory card and Fast Wireless Charging Convertible ($190) or a free Samsung Gear 360 camera ($230).